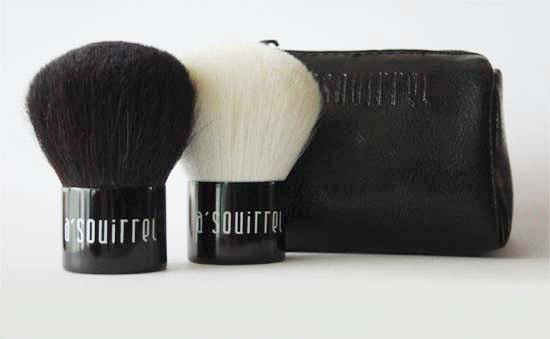 Squirrel Hair Kabuki and Fine White Goat Kabuki Brush Set (with zipper pouch) New Logo! NO NEED TO SHARE! This Kabuki Brush Twin Set is your perfect companion and is a definite must-have in your handbag. The set includes a White Goat Hair (Squirrel Sub) Kabuki Brush or Bronzer for your Powder and a Squirrel Hair Kabuki Brush for your Blush or Cheek Colors. It has a 22mm or 0.87 inch handle (height) which makes it more comfortable to use compared to other kabuki brushes available elsewhere. This set is ideal when you're travelling or on-the-go. You won't want to leave home without it! Faux Leather Pouch:(3.4"L x 2.4"H x 1.6"W). Helpful: Bobbi Brown, Cat Cosmetics, etc Kabuki Brush Comparisons; Kabuki Brush FAQs..
and Other Mineral Powder or Blush Brushes..